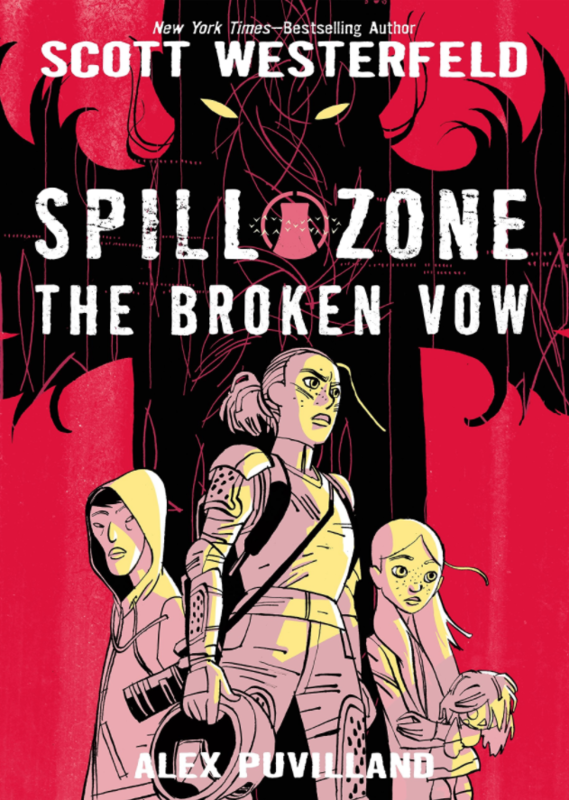 Part 2 of the Uglies graphic novel is out December 4, and I haz cover flats! And finally, Leviathan is out in Brazil . . . with subway ads! I am fancy in South America, it seems. 4:00 pm – Presentation at Cine Livraria Cultura (room 2). 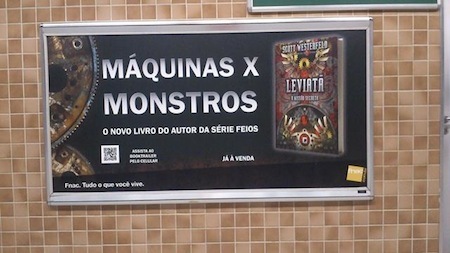 About Leviatã and books with pictures. With simultaneous translation. 2:30 pm – Debate at Livraria da Vila with the public about Zumbis x Unicórnios. With Justine Larbalestier and author Fábio Yabu. Moderator: Ana Lima. With simultaneous translation. 7:00 pm – Signing session at Livraria Cultura/RJ with Scott and Justine. More details following, including (maybe) another event in Rio! It always feels good to have the first comment because, i feel like everybody reads it, ya know? okay maybe thats just me. Will you tour when your new book comes out? If so, will you be in Minnesota? Last time you were here, I figured out you were coming to my local bookstore literally five minutes after you left. Scott, will there ever be a possibility of you coming to Monterrey, Mexico, please?????????? I can’t believe I still haven’t layed eyes on the Shay’s Story… WHY THERE BE NO TIME??? Yay! Now I can ask for a boxed set for my birthday! I’ll throw them at people! I hope I get to reading Shay’s Story before that comes out. A new book from the author of the Uglies series. That’s my best translation of the ad. I might go to Brazil just to see that! i wanna go to Brazil! i don’t know Spanish or Portugese but hey it’s warm there! i wish we had awesome subway ads, too! hmm, Mr. Scott, are those some “Earthsea” books i spy in the background of the photo? at least that’s what it looks like to me… if so, that’s totally awesome! I want so much to see you here! I love your books! I’m a big fan! I’m reading zumbis x unicórnios and one of my next ones will be leviatã! I’m going to collect all the books, read them, THEN throw them at people. Wait…I’ve already read them. Yay, I don’t have to wait to throw them! The SQUEE was supposed to end with EEEEEEEEEEEEEEEE!!!!! but it got cut off. I CAN READ PORTUGUESE!!! Okay, yeah, it was easy to translate, but I feel so happy right now. Then again, I have been taking Spanish for six years….But people always tell me they’re very different. They’re not….But I’m still happy. Scott, I know you’re busy, but there have been no Cutters previews or anything. It’s very depress-making. 🙁 Please? One page of art? @17 but i’m a little hobbit and i’ve come to take your precious! just kidding. 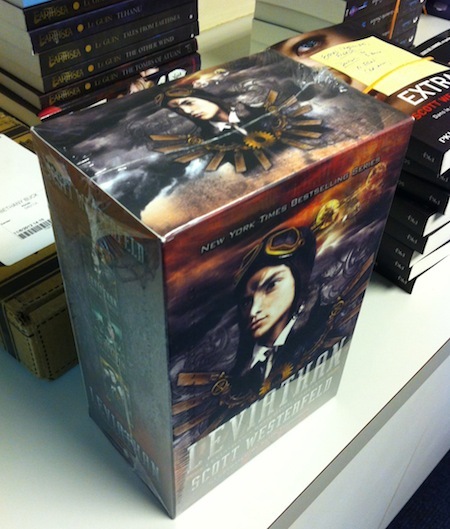 i want the boxed set but it’d be wasting trees on my own greedyness since i already have L, B, and G. but the boxed set is so cool-looking! I’m a student who like your books very much. I had finished the “Uglies”. And I am really excited about the movies of Uglies. I noticed the books are next to Earthsea… that’s nice. Love that tagline: Maquinas X Monstros. AMAZING. Absolutely loved it, Mr. Westerfeld!!! Scott Westerfelf Y You No Go to Atlanta!?!?!? 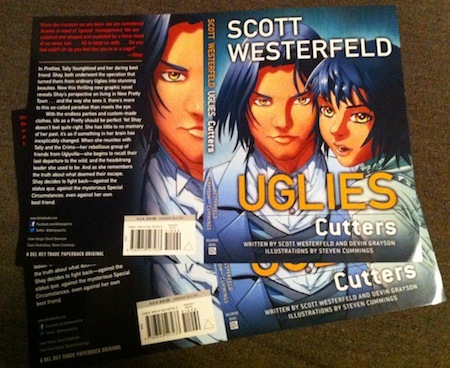 Scott-la, will there be another Uglies manga about them as Cutters? When is Specials manga coming out?? I faithfully bought Shay’s Story and Cutters on the day they came out so I am so dying for this!! I finally got to reading Shay’s Story (school was evil to me and I had literally no time to read for pleasure since I had 2-3 books a week for my lit class). And David’s letter to Shay – just wow. I had to stop reading and just thought about the whole tril and wow. That was painful. Can’t wait for Cutters!